Make a fashion statement by creating a portable time bead necklace! Kids can practice telling time wherever they go! 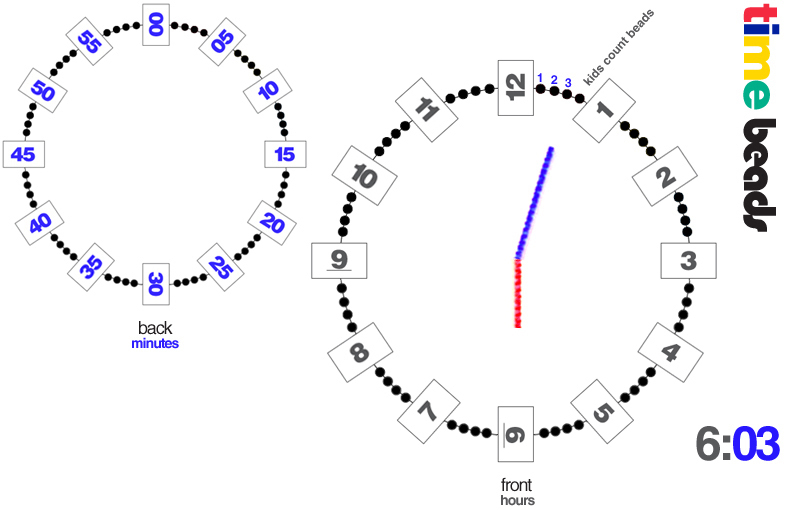 Plus, they can flip over their numeral beads to help them tell minutes on an analog clock. The small beads help them figure out exactly what the minute hand is on. They just count and slide! Numeral paper beads: Cut 24 squares or rectangles out of construction paper. Write numerals on them (1-12) and (00-55 - counting by fives). Staple the squares that match back to back (12 and 00), so you can string it on your necklace. Necklace: Alternate stringing your paper number beads and your plastic beads. Once beads are strung, tie a knot to make a necklace. For the hands, use pipe cleaners or anything else you can find! If you're at a restaurant, grab 2 straws! Kids lay their clock on a flat surface and create a time on their clock. Then, they figure out what time they created! They can cheat and peek, if they're not sure what the minute hand is on.